By Windak. Unknown size but they appear to be 'large'. A pair of type D electric flying gauntlet linings. Manufactured in stockinette fleece, to which the heating element is sewn. The element is encased in flameproof cotton fleece material and the ends of the element are riveted to press stud fasteners at the cuff. Black silk/rayon outer shell. Intended for use with the Type D leather gauntlet in conjunction with the wired 1941 pattern Sidcot suit. There are a few very small holes but in good '+" used condition overall. Labels absent. 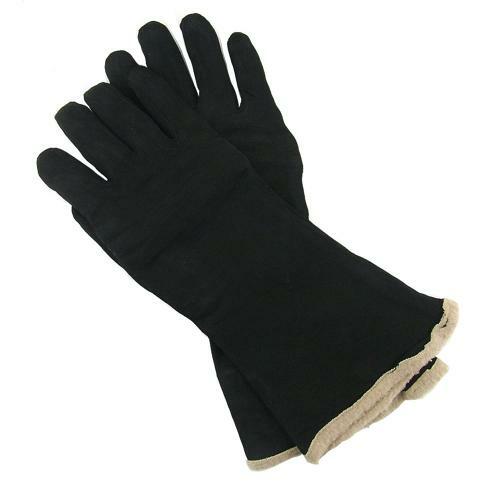 Ideal partner to the type D-gloves also listed. Stock code GA23303.